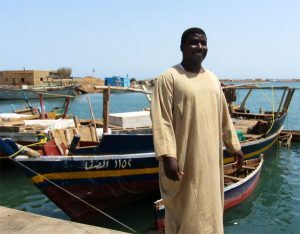 Abdul Rahman Mohammed Manuuk is a fisherman in Suakin locality, Red Sea State, Sudan. He is married and has three children; he has been practising fishing for over ten years, taking up the trade from his father and grandfather before him. Suakin locality is home to approximately 82,000 people and is a significant port for the fishing industry. Poverty and food security are high, with much of the population malnourished and living below the poverty line, dependent on food aid. The project works with fishermen in Suakin to improve their livelihoods by increasing the amount and quality of their catch, thereby reducing food insecurity and poverty in the area. The project links fishermen with local suppliers of inputs (such as ice boxes, fishing gears and GPS systems), and provides training on best practices. Fishermen have improved technology and knowledge and so can catch more fish of better quality, increasing their income and Suakins’ food security. SOS Sahel is a development charity that works with local African organisations to support herders and farmers in Africa’s drylands.